MMA in Los Angeles September 10 | MMA Fighting Events Videos Techniques UFC Fight Picks and News. As the Summer comes to a close, MMA (Mixed Martial Arts) competition is still hot and only getting hotter! If you've missed out on some of the MMA events in Los Angeles this Summer, you get another chance to catch some live MMA action September 10 as Knock Out Promotions puts on Fight Night II at the Normandie Casino. Fight Night II will feature two title fights. Christian Aguilera will be facing Fernando Vargas for the Welterweight Championship and Terrion Ware will be facing Carlos Alaniz for the Bantamwieght Championship. 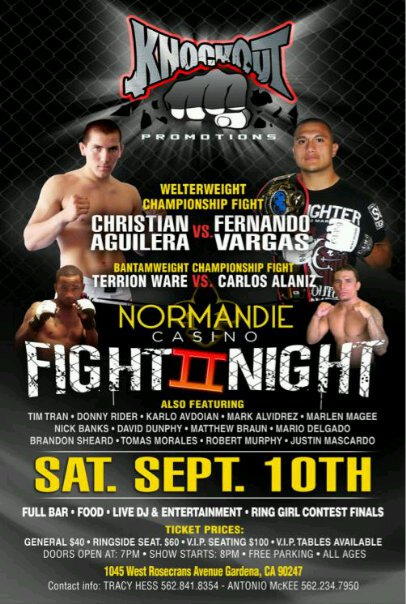 Fight Night II takes place at the Normandie Casino located at 1045 West Rosecrans Avenue Gardena, CA 90247. Doors will open at 7 p.m. and the event gets started at 8 p.m. There will be a full bar, live DJ, and a ring girl contest! If you're in the Los Angeles area, and you want to catch an MMA show, this will be the place to be September 10. Tickets for Fight Night II are $100 for VIP, $60 ringside, and $40 general admission. Contact Tracy Hess at 562-841-8354 or Antonio McKee 562-234-7950 for more info.